There’s no doubt that hiking is one of the most pleasurable forms of exercise, and the freedom of being out in the country is exhilarating, especially after a long week of work. There’s one thing both beginners and experienced walkers have to keep in mind, however – the weather. It can affect where you walk and whether you even go walking. Knowing what’s coming can even save your life. Many people catch the weather forecasts on television or radio. The local ones give a reasonable picture of the general weather in the area. For most hikers who are just venturing out for the day, this should be adequate. Pay attention to what’s going to happen and when; if rain is expected, for instance, a good forecast will be able to give you a fair idea of when it’s likely to begin and how heavy it will be. The closer to the time you plan on leaving that you check the forecast, the more accurate it will be (and, conversely, looking ahead several days is unlikely to yield information that’s very useful to you). If possible, make it one of the last tasks before leaving the house. Depending on what you hear, it could change your plans entirely. In the British Isles rain is a fact of life. 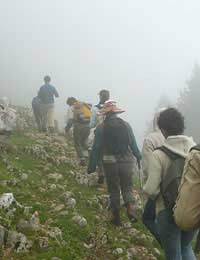 It’s not something to discourage some hiking as long as it’s not too heavy. But rain that comes on top of several days of rain will mean that there are many places you simply shouldn’t go. They’ll be dangerously boggy, and if near water, the stream or river might have broken its banks. Knowing what’s coming can help you formulate your plans properly. You’ll know what’s safe and what’s not. Similarly, if snow is forecast the simplest advice is to stay at home. In rural areas even a small amount of snow can make roads treacherous. In higher areas, winds can quickly create snowdrifts and highly dangerous blizzard conditions. It’s simply not worth the risk. When you’re out walking, you should definitely keep your eye on the weather, especially if changeable conditions are anticipated. Remember, the weather can alter very, very quickly and leave you stranded. If you know that there could be rain, make sure you have a good rain jacket in your backpack, even if it’s gloriously sunny when you set out. Plan your route on a map so you’re always aware of where you are on your route. Keep your eyes on the sky to be alert to possible changes of weather, such as clouds gathering on the horizon. This will give you time to find your way to shelter or even back to the safety of your starting point. Taking these precautions can save you from receiving a drenching. As with so many things, preparation is the key. Know what the weather is likely to do, but plan for most eventualities. A light rain jacket takes up virtually no room and adds little weight. Even a sturdier rain jacket can be squeezed easily into a day pack. Don’t, though, pack rain trousers unless you think there’s a good chance you’ll run into heavy rain; they make progress awkward. Be ready, stay alert, and always err on the side of caution when it comes to weather.